Whitt's Dustless Blasting offers many paint removal services. Our Goal is to provide high quailty service a resonalble prices. At Whitt's Dustless Blasting we are a mobile paint removal service, so we come to you where ever you need to have paint removed. Please give us a call at 404-922-1752. Whitt's Dustless Blasting is drastically faster than sanding and soda blasting. Because the water reduces friction and prevents heat, there is no risk of warping like there is with sandblasting. Additionally when the Rust Inhibitor is used properly, chlorides are removed, leaving a perfect paint ready surface. Dustless Blasting solves the warping problem caused by sand blasting, and the paint adhesion problems caused by soda blasting! The Dustless Blasting process is faster, cleaner and greener than any other paint stripping technology available. in one step. The rust inhibitor removes all chlorides creating a paint ready surface and preventing flash rust for up to 72 hours. The anti-fouling paint on the bottom of a boat needs to be replaced periodically. This often involves weeks of sanding and grinding. E Whitt's Dustless Blasting, Our proprietary media blasting systems can remove anti-fouling paint in a fraction of the time! Whitt's Dustless Blasting can even open blisters in the fiberglass gel coat without damaging the gel coat itself. We can blast fiberglass, aluminum, and steel boats or yachts. Whitt's Dustless Blasting is excellent for the removal of paint, polyurethane, lacquer, stain and any other coating from wood quickly and easily. Even old wood can be made to look brand new, as shown in the photos below... Don't try to blast a balsa wood airplane though; It won't fly worth a dern afterwards. Whitt's Dustless Blasting is the perfect solution to remove paint, calcium deposits and stains from your gunite/concrete pool. The Dustless Blasting process is the most efficient way to remove all coatings of the old and flaking sealant and leaves the gunite/concrete pool surface clean and ready to be re-sealed and finished. Whitt's Dustless Blasting is excellent for the removal of paint, polyurethane, lacquer, stain and any other coating from wood quickly and easily. Even old wood can be made to look brand new. Keeping fleet vehicles up to date with fresh paint jobs and decals can be a time consuming and expensive process. Chemical stripping is messy and caustic, sanding is a wildly inefficient hassle, and sand blasting can easily warp the sheet metal panels. Whitt's Dustless Blasting is the fastest, easiest, cleanest way to strip paint from aluminum trailers. The water in the Dustless Blasting process reduces friction and heat. In fact, Dustless Blasting reduces the temperature about 10 degrees from ambient! That means no warping, no more trying to grind around rivets, and no more peeling off decals and dealing with gummy adhesive. The Dustless Blaster removes paint and vinyl stickers all at once. Whitt's Dustless Blasting is an excellent tool for lead and asbestos paint abatement. Since there are strict rules about how much lead and asbestos can be released into the air, traditional sand blasting is not a good solution for asbestos abatement. The water in the Dustless Blasting process helps suppress asbestos and lead contamination, making containment that much easier. This type of work generally requires special certifications or licenses. Whitt's Dustless Blasting is an excellent solution for blasting within refineries, chemical plants and even on live pipelines. The water in the Dustless Blasting system suppresses dust, sparks and static electricity, making it far safer than traditional dry blasting. The ability to get surface preparation done quickly and efficiently without having to shut down plant operations is invaluable. With the Dustless Blasting system, you can remove paint, primer and most other coatings, while also removing rust, grease, and any other contaminants that are present, in one step. The rust inhibitor removes all chlorides creating a paint ready surface and preventing flash rust for up to 72 hours. Graffiti is a problem that plagues virtually every community. It detracts from the aesthetics, decreases value and can even deter customers from visiting a business. Pressure washing won’t get rid of it. Sandblasting can destroy the original material. Soda Blasting kills nearby grass and plants. Dustless Blasting obliterates graffiti, leaves the original surface intact, and the nearby plants unharmed. Whitt's Dustless Blasting is the perfect solution for removing pavement striping. The Dustless process removes paint or thermoplastic completely, leaving no trace behind. Unlike traditional sand blasting or grinding, this process does not damage the concrete or blacktop. Heavy machinery usually features heavy, industrial strength coatings which would be difficult to remove with traditional methods. If you need to remove heavy, industrial strength coatings, there is no better process than Whitt's Dustless Blasting. The water used in the Dustless Blasting process vastly increases the mass and energy that is coming out of the nozzle, which enables it to obliterate coatings that are specifically designed to be resistant to abrasion and wear. Bulldozers, backhoes, fork lifts and other heavy machinery can be stripped more cost effectively with Dustless Blasting. Because water does not compress like air does, our wet blasting process has more force than traditional dry blasting. Additionally the water reduces friction, heat and dust, which means no warping metal, and less environmental impact. Removing powder coating can be an extreme challenge. It usually involves very caustic and hazardous chemicals, or industrial size ovens that heat to 1,000 degrees. Sand blasting is also an option, but not a good one since it takes about 30 seconds for every square inch of powder coating to be removed. According to most powder coating experts, chemical stripping is the "easiest" way. Whitt's Dustless Blasting is the simplest, fastest, and most environmentally friendly way to remove powder coating. 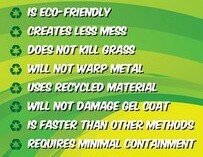 It involves no toxic chemicals, and uses environmentally neutral recycled glass abrasive mixed with water. The water in the Dustless Blasting process cools the powder coat, making it brittle, which allows it to erode away quickly and easily.